Early in 1703, during the Great Northern War, Peter the Great’s forces captured Ingria (Ingermanland), a sparsely occupied, boggy territory at the Eastern end of the Gulf of Finland, from the Swedes. On 16 May (27 May n.s. 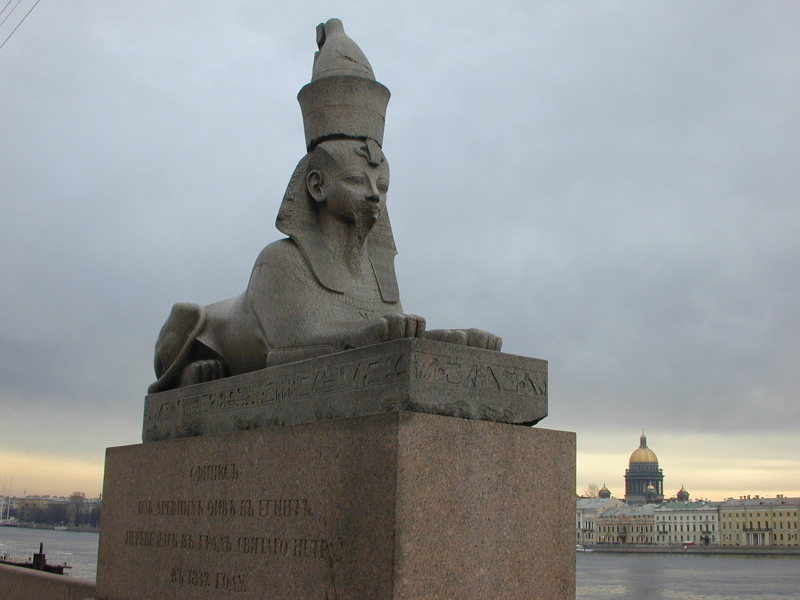 ), work began to construct the Peter and Paul Fortress on Hare (Zaiachii) Island, just off the Northern bank of the Neva river, and on 29 June, Peter named the settlement Sankt Pieter Burkh, in honour of his patron saint and as a mark of his admiration for Dutch culture. 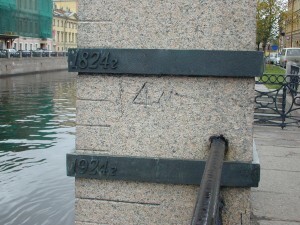 The name was soon russified to Sankt Peterburg (Saint Petersburg), and it officially became the Russian capital in 1712. Tradition has it that the city grew in accordance with Peter’s edicts and was laid out to a careful plan from the beginning. The growth of the settlement was certainly rapid, and there were plans and edicts aplenty, not to mention coercion. At the upper echalons of society, Peter ordered his nobles to move to the new city and build palaces there, and he gave instructions about their appearance and dimensions, in order to achieve uniform perspectives. At the lower level, tens of thousands of serfs, prisoners of war and ordinary prisoners were drafted in to carry out the labour in appalling conditions (Lincoln, pp. 20-21). Petersburg’s reputation as being built on bones is well deserved; Berman likens the construction to that of the Pyramids (p. 178). But despite the construction of major buildings on the island – the Twelve Colleges, to house the governement administration (later home of the university), the Kunstkammer (the city’s first museum, housing ethnographic and anthropological collections), and the Menshikov Palace, built by Peter’s favourite noble – this low-lying area was so prone to flooding that it too was unsuitable. Meanwhile, Petersburg began to grow willy-nilly, around Trinity Square on the mainland beyond the Peter and Paul Fortress, and on the Southern side of the Neva. The latter became the centre of the city. 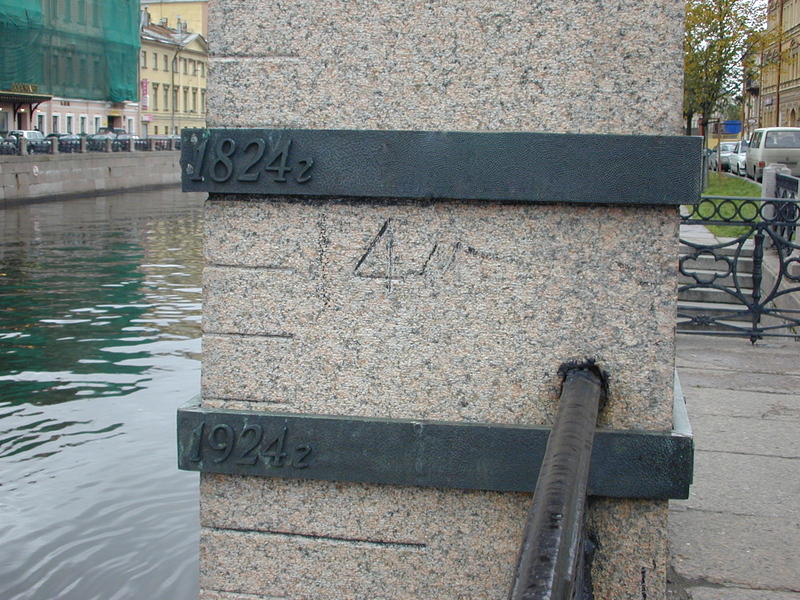 Over the next hundred years, Petersburg’s landmark buildings, ensembles and squares – the Winter Palace, The General Staff Headquarters, Palace Square, the Admiralty and so on – as well as the distinctive road layout, with three major thoroughfares radiating out from the Admiralty, were built on this side of the river, alongside numerous palaces for the Russian nobility, and more spontaneous lower-level development in the spaces between the imperial city’s monumental constructions. 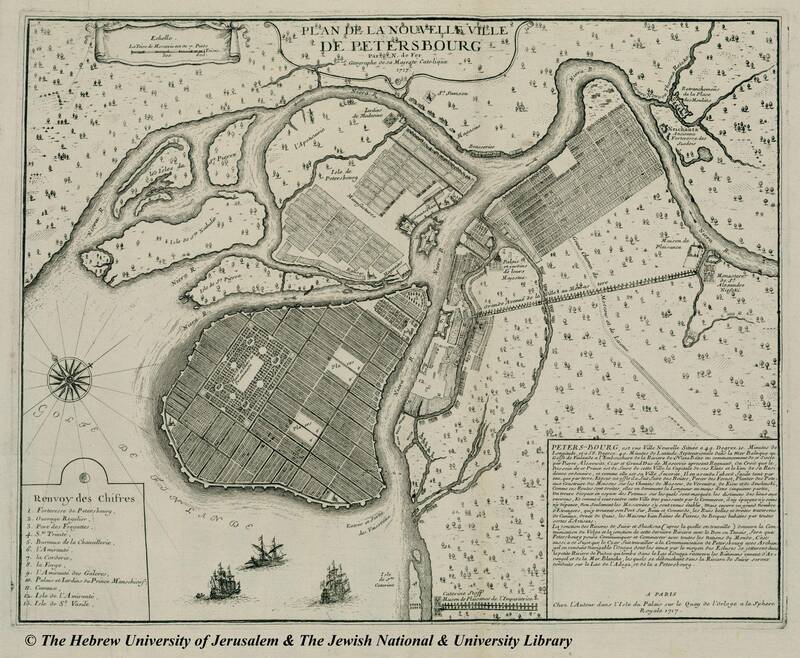 St Petersburg’s early fortunes were somewhat precarious, and in 1727, two years after the death of its founder, the capital was transferred back to Moscow by his grandson, Peter II (Lincoln, pp. 31-2). This led to a halt in the building programme and a period of rapid decline – the nobility gladly abandoned their forced new abodes and the city’s inhospitable climate. But following Peter II’s sudden death in 1730, the return to the city by the new empress, Anna Ivanovna, was the catalyst for a huge boost in development which continued for another century. 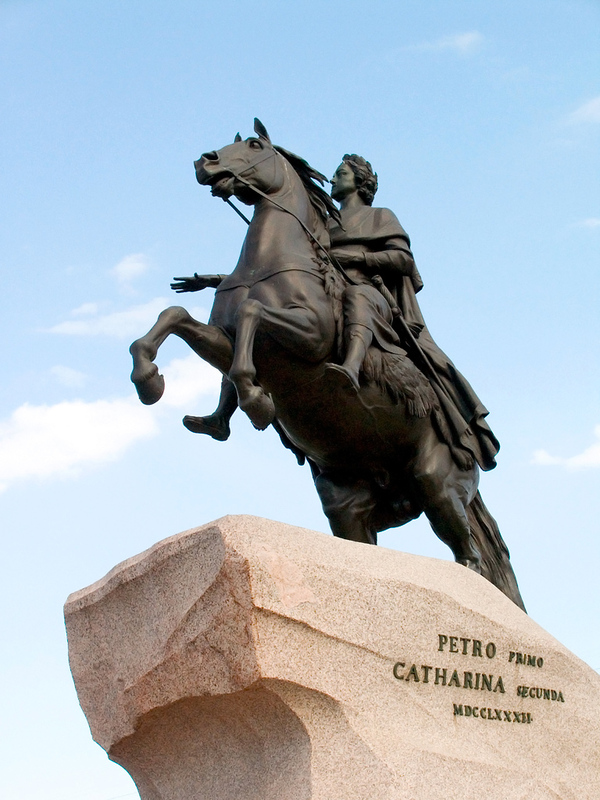 The Petersburg we know today, with its mixture of baroque, rococco and classical buildings, is in many ways far more the city of Anna and her successors, Elizabeth, and Catherine the Great, than it is Peter’s city. Although Trezzini’s Cathedral of St Peter and St Paul was one of the first landmarks to dominate the skyline – its 394-foot spire (Lincoln, p. 30) announcing its departure from the norms of Russian church architecture in the most forthright manner – Petersburg was planned as the centre of the state’s secular institutions. In addition to the imperial court, the city was home to a large military garrison and the sea-loving Peter’s Russian fleet; it is no accident that all roads lead to the Admiralty. Peter also introduced the hierarchical and militarized bureaucracy – civil servant wore uniform to denote rank, as, ultimately, did other groups such as students – which had an enormous impact on life in the city. The role of Petersburg as a service city explains the imbalance of its population, which, until the late 1860s, was predominantly male (Bater, p. 168). The majority of inhabitants of all classes were transient migrants; it was normal for men to leave their families in the provinces when they came to came to the city to work (Bater, pp. 172, 187). It also in part accounts for one of the unusual features of Petersburg’s poverty, which otherwise resembled that of any other modern European city: the existence of an educated proletariat, subsisting at the bottom of the civil service’s table of ranks and living in corners in the capital’s poorest districts. It was in the depiction of this class that Petersburg literature first acquired its distinctive colouring. In the eighteenth century, the founding myth of the ‘Northern Palmyra’ was being expressed in odes by poets such as Sumarokov, Lomonosov, and Derzhavin (Antsiferov, pp. 49-55), but it was Alexander Pushkin’s 1833 poem The Bronze Horseman that crystallized the image of the city by combining this story with that of one of its lowly inhabitants. The poor government clerk Evgeny, crushed by the city’s faceless bureaucracy, is finally destroyed by the 1824 flood that kills his fiancee. He dares to rebel, shaking his fist at the statue of Peter the Great, which comes alive and chases him through the streets of the city, driving him insane, and finally to his death. Although Petersburg features in many of Pushkin’s works, such as The Queen of Spades, it is The Bronze Horseman, as Berman states, that ‘points the way’ for subsequent generations of Petersburg writers (p. 182). The malevolent city victimizes its inhabitants through its cruel, autocratic founder and the oppressive bureaucracy he imposed, while untamed nature seeks its revenge not on the hubristic Peter, but on his hapless subjects, whose attempts to fight back, like that of the failed Decembrist revolutionaries of 1825 to whom Pushkin’s tale alluded, are easily brushed aside. The resulting madness and fantasy, fuelled by the unhealthy climate, are barely concealed beneath the everyday life of the city. The growth of the ‘Natural School’ literature in the 1840s intensified the focus on contemporary social questions that marked it as the precursor of Russian realism, but its Petersburg form also emphasized the sick, ‘unnatural’ character of the city. It chief proponent was Gogol, whose Petersburg stories, whilst touching on social themes, are memorable for their fantastic elements. Some of these – the ghostly thieves in The Overcoat, divesting well-to-do passers-by of their outer garments, the talking dogs in Diary of a Madman – may be amenable to naturalistic explanations, but when Major Kovalev’s nose detaches itself from his face in The Nose and takes on a career of its own, the spectral nature of the city becomes fully surreal. Other Petersburg literature of this era is more grounded in the city’s everyday reality. 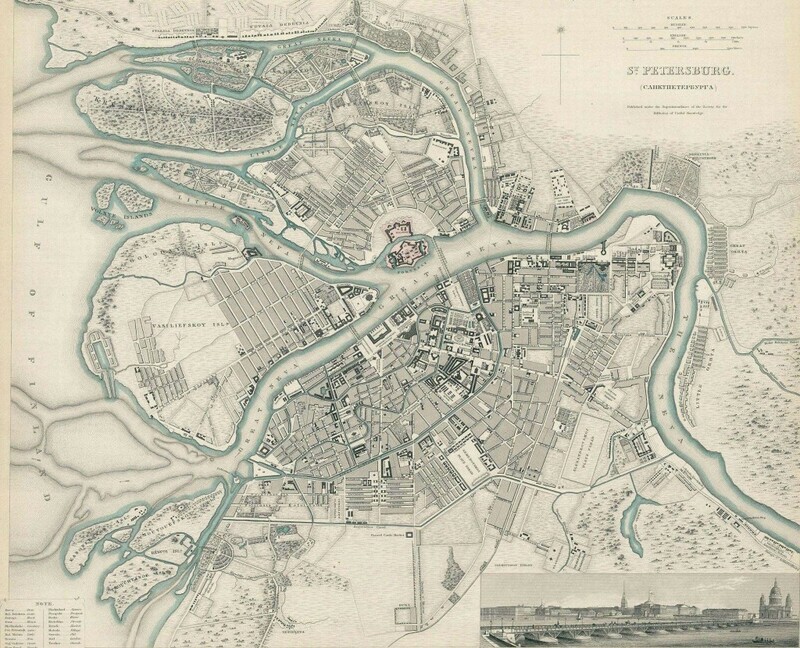 Nikolai Nekrasov’s 1845 collection, Petersburg Physiology, which contains sketches of lower class characters and areas as well as critical works on the city and its literature, offers a good perspective on the era and its conception of the city as a living organism. This was the context in which Dostoevsky produced his first work, Poor Folk, initially published in another Nekrasov venture, The Petersburg Collection (1846). Ostensibly a classic work in the Natural School genre, this story of a poverty-striken government clerk is also significant for its self-reflection on the Petersburg tale. The hero, Makar Devushkin, having read The Overcoat, is horrified at the injustice it depicts – not only at Akaky Akakievich’s plight but also at it being exposed in this way – and fears that it is actually a portrait of himself. His ultimate humiliation comes when a button falls from his ragged uniform during an interview with his superior; he sees the scene in a mirror and is, as Bakhtin notes, fully aware of his own degradation. a Petersburg nightmare, … a personified sin, … a mute, mysterious, gloomy and wild tragedy, with all its frantic horrors, catastrophes, peripeteias and unhappy endings … a book, a musical motif, some memory from real life, in a word, one of the thousands of insignificant reasons, and the poison is ready, and once more his imagination begins to roam over the emblazoned, fanciful canvas of his quiet, mysterious dream world. In the streets he walks with a drooping head, paying little attention to his surroundings, sometime completely oblivious of reality even there, but if he does notice something, then the most ordinary trifle, the most insignificant fact assumes a fantastic coloring in his mind. Indeed, his mind seems attuned to perceive fantastic elements in everything (Dostoevsky’s Occasional Writings?, pp. 35-6). Not merely an inhabitant and victim of the city, but an embodiment of its oppressive, contradictory, hallucinatory qualities, the ‘dreamer’ acts as a transitional figure, pointing the way not only to the ideological heroes of Dostoevsky’s mature period, but also the image of Petersburg in the literature of subsequent generations. The maps (Nicholas de Fer, 1717; Society for the Diffusion of Useful Knowledge, 1834) are in the public domain and are reproduced from the Historic Cities website. 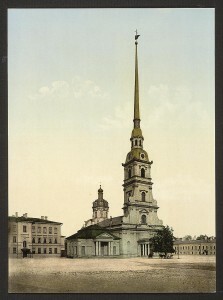 The photochrom print of the Cathedral of St Peter and St Paul is in the public domain and reproduced from the Library of Congress Prints and Photographs Division. The photograph of the Bronze Horseman by Lite is reproduced from Wikimedia Commons and is governed by the terms of the Creative Commons Attribution-Share Alike 3.0 Unported license. The photographs of the Sphinx and the flood level markers are by Sarah J. Young, and are governed by the terms of the Creative Commons Attribution-Share Alike 3.0 Unported license.